You can find the female Eastern Carpenter Bee (boring bee), common in Virginia, under eaves of homes, wood railings and floor joists under a raised wood decks. Treated lumber does not deter the carpenter bee as they do not eat the wood. The female bores holes into wood to place her eggs as male carpenter bee acts as sentinel while she works. 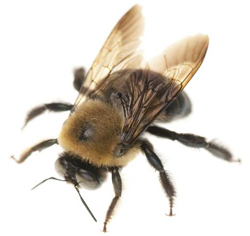 Male carpenter bees have a yellow or white mark on their face and do not sting. The carpenter bee is similar in appearance to bumblebees, but has a mostly black body and a hairless patch between their wings. In Virginia they are most active in April and May. The carpenter bee typically builds a nest by chewing a vertical 3/8" hole then continues boring horizontally for 6 inches or more. Carpenter bees prefer to nest in milled pine or cedar lumber but may be found boring into other various types of wood. Over time these nests can become connected to other carpenter bee nests causing timbers to become damaged and weak. The carpenter bees nest may not be obvious as they will typically bore from the underside of timbers but they will leave fairly large pile of saw dust or "frass". If you find frass look up, you will probably find the hole the carpenter bee is preparing as to lay eggs in. The nest have multiple branches, if multiple females are present, with each adult female living and laying eggs in a separate branch, but they will share the same entrance. Because the nests are time consuming to build, it is common for females to try to reuse old nests. They can lay between 5 and 10 eggs in a season. The carpenter bee lays her eggs around July. After a carpenter bee (wood boring bee) lays her eggs, they begin to run out of steam. You may see them resting on flowers, failing to the ground from flight or even walking about. By early August the adult carpenter bees that worked so hard to build the nest will die. The new generation of carpenter bees will hibernate in the nest through the winter and early the following spring will begin the cycle all over again. Carpenter bees if not treated will cause quite a bit of damage to wood. If you live in an area that has woodpeckers the damage will be even worse as woodpeckers will tear into the wood to eat the larvae leaving a long open space in timbers. Call Brown Exterminating today for a carpenter bee inspection and quote. Carpenter bees can be treated but depending on the situation may require yearly treatment to gain control. We are a full service exterminating company with over 40 years experience servicing Waynesboro, Fishersville and Staunton Virginia and surrounding areas. Call today for a free inspection and quote.